Publisher: Atlantic Publishing Group, 2011. Soft Cover, 288 pages, 6x9. Beer is one of the most complex alcoholic drinks with some beers having more than thirty ingredients and most of them requiring the proper mixture and amounts of the right hops, malts, and herbs to taste just right. For anyone considering creating their own beer, one of the most fun and effective ways of acquiring all of these ingredients is to grow your own hops, malts and herbs and experiment in mixing them together. 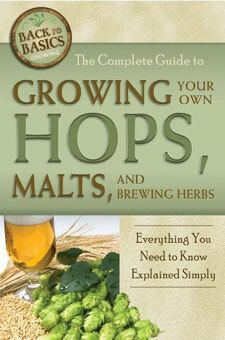 But, with more than fifty kinds of hops alone and hundreds of brewing herbs at your disposal, knowing what you should grow and how to grow it can be quite hard. This book will guide any prospective brew master through the process of growing their own brewing ingredients from inception to harvesting. You will learn all of the many advantages to growing your own beer materials, starting with the control you have over the maturity, strength, types, and volume of those materials. You will learn how to home grow your own hops, with detailed instructions and information about the taste and effect of more than a dozen different strains of hops. You will also learn which grains and malts are used in beer making and how you can start growing your own depending on your needs and your location. You will learn how to concoct your own brewing herbs and finally how to start combining everything into the ideal mixtures to form your own beer. Beer experts from professional brew masters to backyard microbrewers have been interviewed and asked how to best utilize these methods and their insights have been provided to you to help get you through the complex process of beer growing and production. You will learn the proper measurements and conversions for everything you will make as well as being given a source list for every possible supply that might be needed. Finally, you will be provided with a list of the top homegrown recipes for beer available, allowing you to create and enjoy your very own brews in the comfort of your home.